Rural America is at a crossroads in its economic development. Like regions of other First World nations, the traditional economic base of rural communities in the United States is rapidly deteriorating. Natural resources, including agriculture, show little prospect for generating future job growth, and manufacturing has become a new source of instability. Faced with these changes and an increasing vulnerability to international economic events, rural communities have begun to seek high-technology industries and advanced services as candidates for job growth and economic stability.What is the potential for high-tech growth outside the largest cities? What is the role of high-tech industry in the economic development of non-metropolitan America? 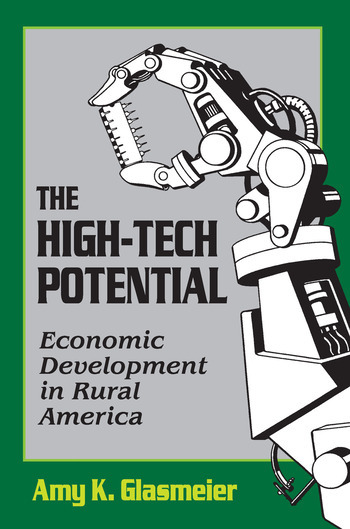 This book provides a hard-nosed look at the high-tech potential in rural economic development. Some of the questions Glasmeier addresses include: Are rural areas attractive to high tech? Will high tech follow earlier patterns and filter down the lowest-paid jobs to rural areas? Will rural communities be bypassed completely for even lower-wage Third World locations?Glasmeier answers in a sober analysis that separates fact from myth. Empirical data reveals the kinds of high-tech jobs that locate in rural areas, and the kinds of rural areas that attract high-tech jobs. This analysis leads to a highly critical evaluation of state and local economic development policy and recommendations for its improvement. This book is a must for policymakers, practitioners, scholars, and an informed public interested in the promise of high tech and the future of US economic development.